Lets get down to business. You’ve heard me talk about the produce in my mother’s vegetable garden? Of course you have, I’ve only been talking about it for the ages. 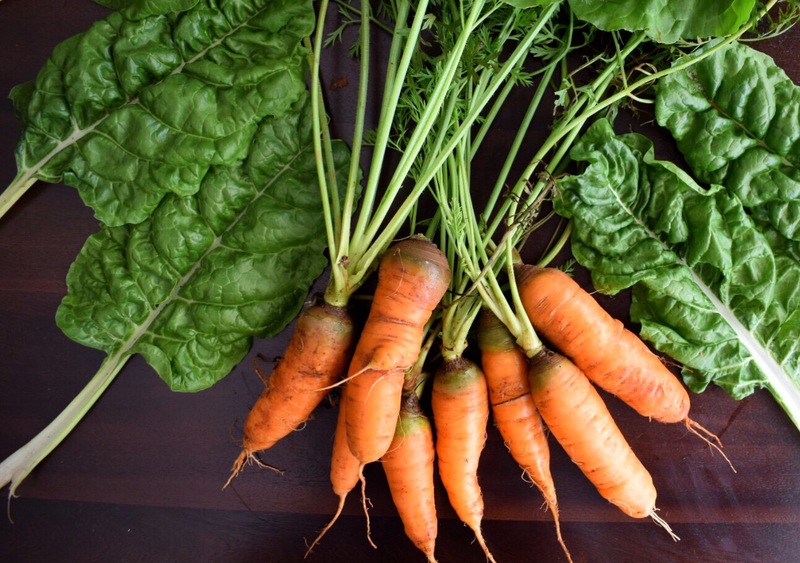 We’ve got spinach, carrots, tomatoes, leeks and onions! 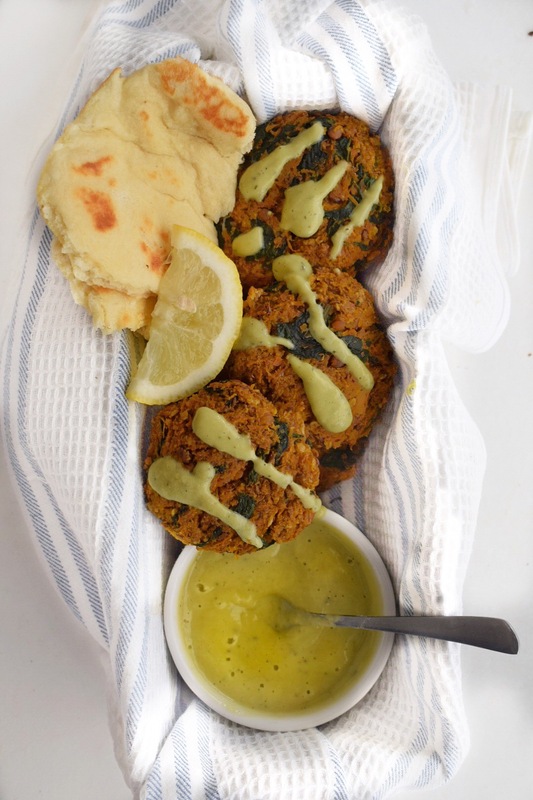 For previous posts about these groegiurs veggies, check out these Carrot Cake Pancakes and these Spinach Falafel. For today, we’re going to talk about how I used the spinach and carrots to prepare your next greatest lunch project. I’m on a roll right now as far as meatballs and patties are concerned. Falafels, burgers, meatballs, I’m really taking advantage of all the vegan foods. Now it’s no fun to just throw a couple of vegetables in a food processor, pulse and throw it in the oven. No my friends, we have to make it interesting! That’s where the various spices I’ve thrown in here come in. Added bonus: they really bolster the nutritional value of this dish. Trust me when I tell you that you need to get into adding spices to your food. Take for example this Golden Spiced Pineapple Cooler I made a couple of weeks ago. It’s delicious, insanely healthy for you and has a gorgeous colour! So before you start to think twice about the number of spices involved in this dish, remember how every little ingredient contributes to the goodness of these cakes. 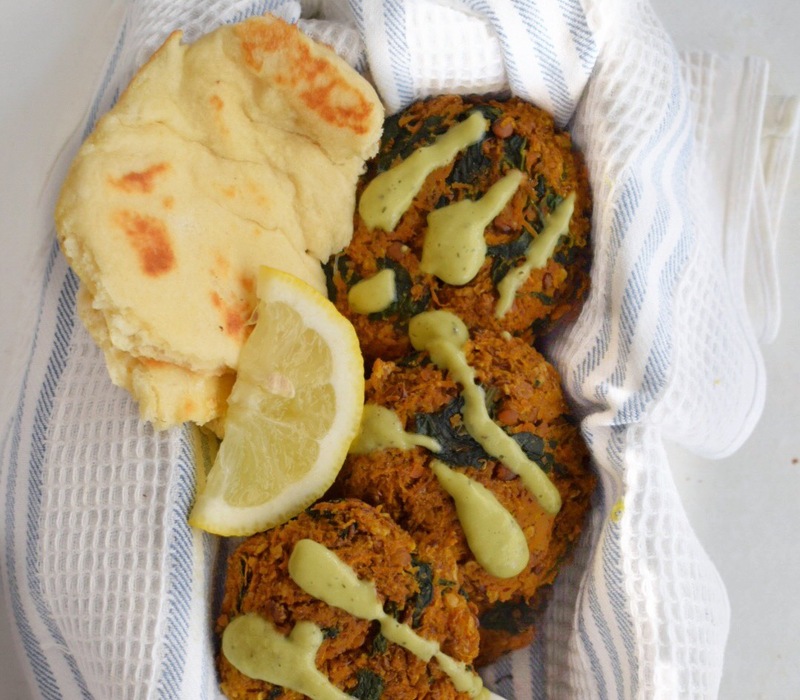 These carrot cakes are delicious tucked into a pita or between 2 pieces of naan with a side of roasted vegetables. The avocado sauce is a must and helps take some of the heat off if you find that they’re too spicy for you. Make these in bulk and freeze just before baking so that you can defrost and cook as you need them! Enjoy! Add the lentils to a medium saucepan and cover with 2 cups of boiling water. Cook on medium heat for 12-15 minutes or until they have soaked up all the water and are soft. Remove and allow the cool. In the bowl of a food processor, combine the carrots, cooked lentils, 1/2 cup of the rolled oats, garlic, lemon juice and olive oil. Pulse a couple of times until the ingredients are well combined and you have a thick batter. Remove the batter to a large bowl. Add the other half cup of oats, bicarbonate of soda, cumin, coriander, cayenne, black pepper, cinnamon, nutmeg and spinach. Use a large wooden spoon to blend all the ingredients together, making sure that there are no pockets of dry spice. Line a 9×13 inch pan with parchment paper/aluminium foil and preheat your oven to 180C/350F. 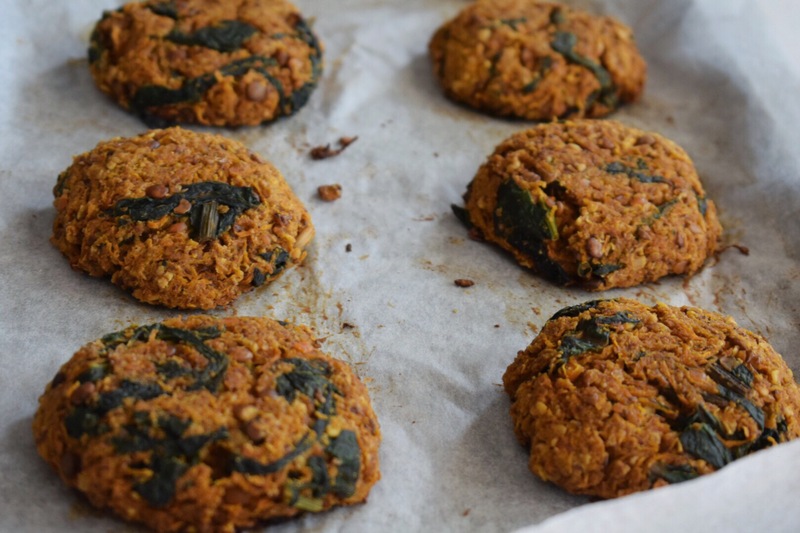 Grab a heaping tablespoon of the carrot spinach mixture and shape into a patty with your hands. It’s much easier if your hands are damp. Add each patty to the baking sheet as you form them, making sure to leave some space in between them. Bake for 25-30 minutes or until slightly golden brown. 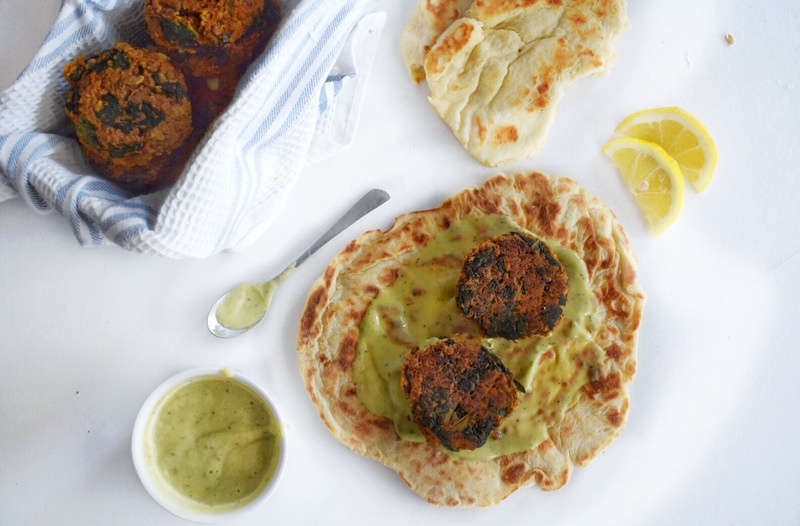 Serve hot with the avocado dressing, some naan and extra roasted veggies. Enjoy! Add all the ingredients to the bowl of a food processor and pulse until combined. Keep leftovers tightly sealed in the fridge for up to 10 days. Like this? Share with your friends! 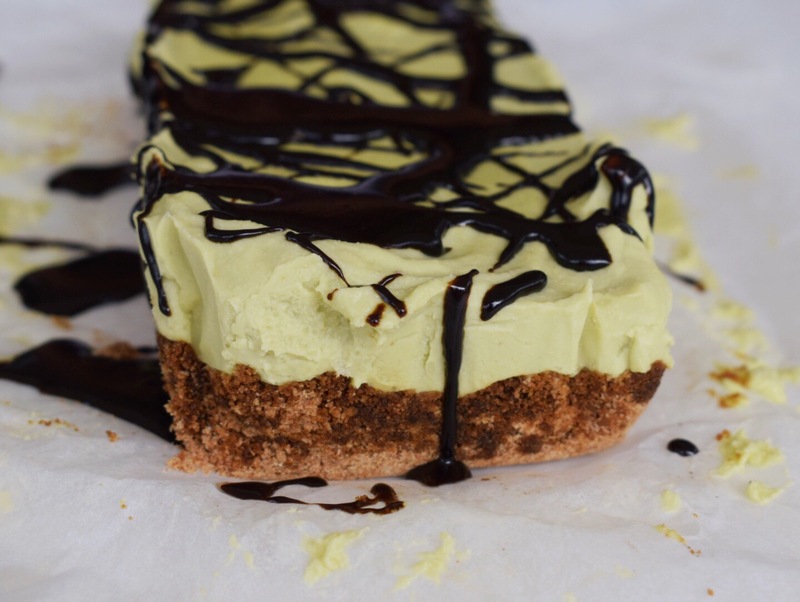 When your dessert is made of avocados, you can eat as much as you’d like without feeling guilty #score. Fair warning though: this dessert is not as sweet as my other vegan cheesecake recipes. If you’re looking for something on the sweeter side, look here for some golden caramel goodness and over here for a sweet passionfruit glaze. Everyone who’s up for a tangy dessert stay with me! 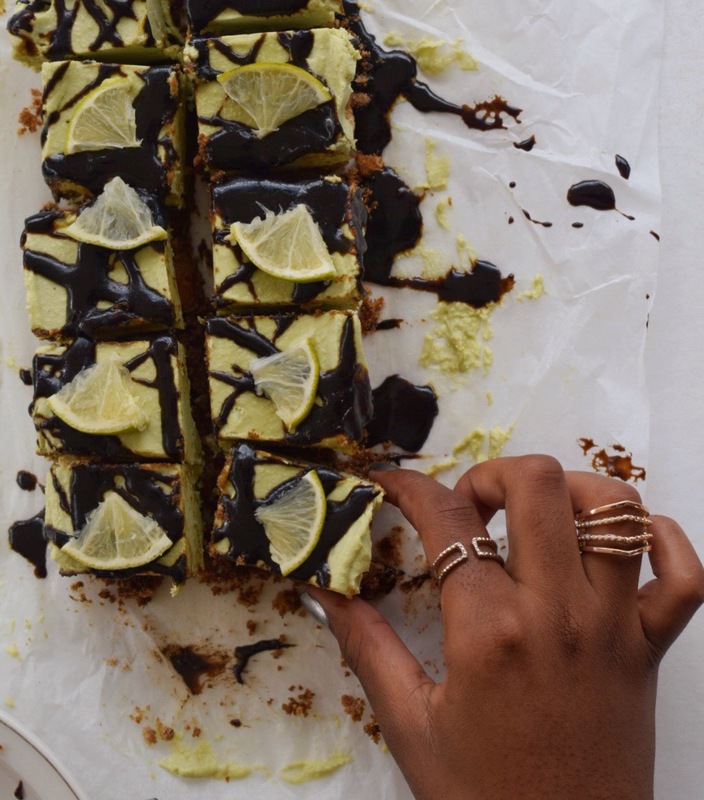 I finally found a use for the Weetbix biscuits that were taking up space in the pantry and that is ——–> the base for these lime cheesecake bars! At the end of last year, we ran a triathlon for women’s cancer and every team that competed won a box of Weetbix biscuits and a Snickers bar (you can guess which one I went for). Unfortunately that means the Weetbix has been at the back of the pantry, feeling lonely and ignored. To be honest with you, I hadn’t thought about it until I ran out of almonds to use for the crust and had to look to alternative methods. Needless to say, it worked out well! You can still go with almonds if you wish, it will still yield a delicious dessert! 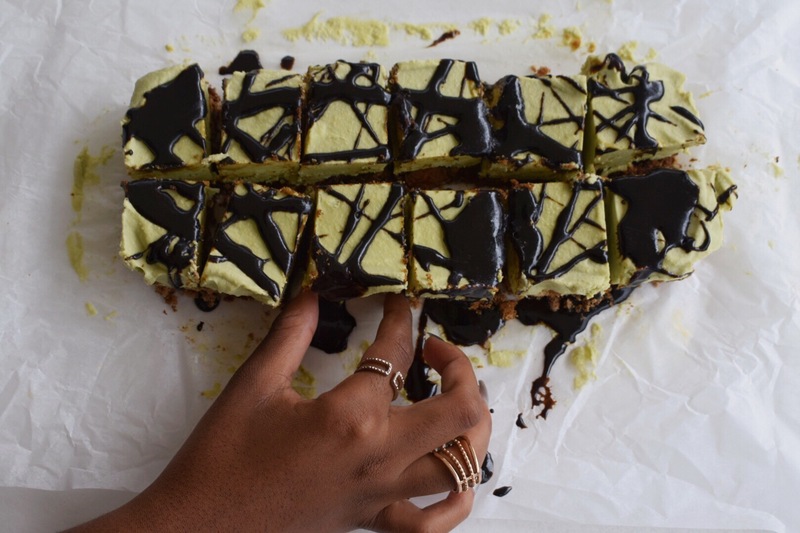 Here’s to friends who come over to hand model food for you! Line a standard loaf pan with parchment paper. Combine the crushed Weetbix biscuits and dates in a food processor and blend until it forms a sticky dough. Press the dough into the bottom of the loaf pan in an even layer. Freeze whilst you prepare the filling. Rinse out the food processor and proceed to blend together the avocados, cashews, lime juice, syrup and water. If the mixture is too thick to pulse, add more water 2 tbsp at a time until the machine can smoothly process it. Pulse for 2 minutes or until smooth and creamy. Spread the mixture in an even layer on top of the base. The mixture should be very thick. Freeze for 1 hour or until solid. Store in the fridge, do not freeze after it has set. Let sit at room temperature for 10 minutes before slicing and serving. 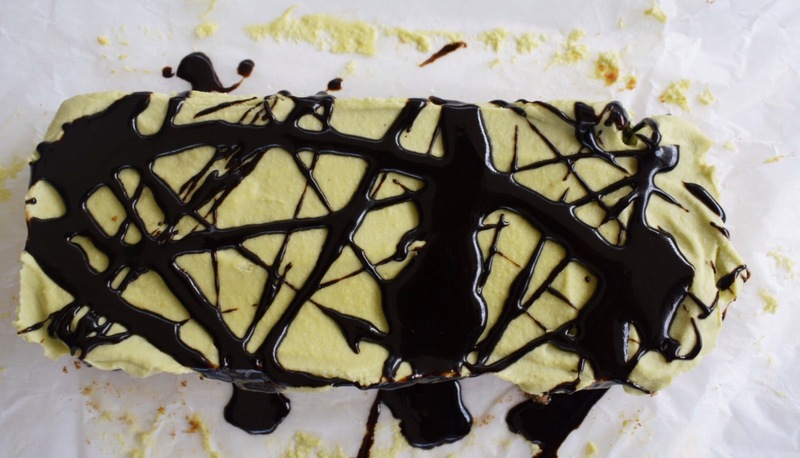 Drizzle with melted chocolate and enjoy!